You are currently browsing the archives for the Bernie Sanders category. Here’s something that I just thought of that’s worth considering. President Obama didn’t endorse a single DFL candidate in Minnesota. He didn’t endorse Keith Ellison. He didn’t endorse Tina Smith. Question: Is that because they’re both Bernie followers? Also, as I said earlier, President Obama didn’t endorse Alexandria Ocasio-Cortez. She’s a Bernie candidate, too. Question: Is this the start of a fight between the establishment and the Bernie wings of the Democratic Party? Only time will tell but I can’t rule it out. RNC Chairman Ronna McDaniel made a great point in her interview with Harris Faulkner when she asked if Democrats would highlight the fact that President Obama had endorsed them. I’m betting they won’t highlight it. Yesterday morning, Tina Smith was interviewed by KSTP’s Tom Hauser. On another network, Bernie Sanders, aka Sen. Smith’s mentor, appeared on CBS’s Face the Nation with Alexandria Ocasio-Cortez, the Democrats’ latest rising star. During her interview with Hauser, Smith confirmed that she supported single-payer health care and that she wouldn’t vote for any judges on President Trump’s list because “far right special interests” compiled the list. (I’m wondering if that means that she wouldn’t vote to confirm any judges approved by far left special interest organizations like NARAL Pro-Choice, PFAW, the Center for American Progress, NOW or Planned Parenthood.) These aren’t mainstream organizations based on their lobbyists’ wish list. Speaker Daudt spoke of a farming family he met during a MNsure listening session in Red Wing, MN, who told Speaker Daudt that their premiums this year were $2,300/mo. Then Speaker Daudt said that this family’s deductible for this year was an additional $13,000 this year. This family’s out-of-pocket expenses, which they’d pay before the insurance would pay a penny, was over $40,000. As shocking as that was, the next part was frightening. Speaker Daudt said that that was this family’s premiums before this year’s open enrollment premium increases of between 50% and 67%. That means, at minimum, this family’s premiums for 2017 would exceed $41,000. If their premium increased by 67%, this family’s premiums for 2017 would jump to $46,000. That’s one year’s premiums for a family of 3 healthy people. Let’s remember that Tina Smith was the Lieutenant Governor at the time. Why should I trust someone who presided over the highest health insurance premium increases in Minnesota history? That’s as foolish as trusting an arsonist to put out a building fire. Tina believes every Minnesota family deserves access to high-quality health care that they can afford. In other words, Tina Smith knows that she’s responsible for failing Minnesotans. She was part of the administration that implemented the plan that caused the 59% to 67% premium increases. Now she wants to return to Washington to screw up the system even further than she’s already screwed it up? I think not. I’m voting for someone who will fix problems, not create them. I won’t be voting for Bernie’s ally, aka Tina Smith. “Bold” is a characterization that has been used for Ocasio-Cortez’s own campaign. She told Face The Nation host Margaret Brennan that her agenda included policy positions like Medicare for all. “I think that the factors that ultimately created our win was the fact that we had bold commitments and I campaigned on hard commitments of Medicare for all, tuition free public college, ensuring a Green New Deal for our future and championing those issues were the reason that we won,” Ocasio-Cortez said. Mostly, she won because Joe Crowley didn’t take her seriously enough. It wasn’t because people in that district thought that they were voting for a policy wonk. When Karin Housley visited St. Cloud Thursday, she brought a bold prediction with her. I agree with both predictions. President Trump’s visit to Duluth to rally for Pete Stauber filled the arena with people. The ramp wasn’t just filled with cars. It was filled with people too. With a 4-way DFL primary set to determine who will face Stauber, expect that primary to beat each other up. I’m not sure if the DFL will be able to unite after that fight. I’d rate that race as leans GOP. As for Minnesota’s First District, the DFL doesn’t have a bench. Tim Walz was it. There’s a primary on the GOP side in MN-01 but there’s no signs of it getting bloody. President Trump wants you to quit your job! Well, not really; but the White House’s tax cuts and rollback of onerous regulations have encouraged millions of Americans to do just that. The economy is booming, opportunities are opening up all over the place, and workers are responding, by quitting in record numbers. This may be bad news for Democrats hoping to take over Congress in November. They have no economic agenda that can compete with a buoyant jobs market that is making the American Dream come true. But it is great news for American workers. 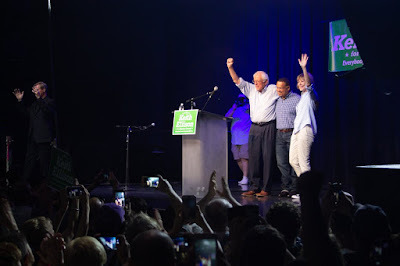 Tina Smith rallied with Bernie Sanders and Keith Ellison this week. If that’s her definition of moderation, I’m betting most Minnesotans will reject that definition. By rallying with Sanders and Ellison, Smith proved that she’s trying to appeal to everyone. Normally, that’s ok. This isn’t normally, though. She rallied with radicals from the #Resistance. Meanwhile, Karin Housley can claim that she’d fight for Iron Rangers, the elderly and economic growth. Housley is smart, reasonable and has an overabundance of energy. She’s exactly the type of candidate that can defeat a check off the boxes candidate like Tina Smith. The polls don’t show it yet but what’s likely going to help Republicans like Karin Housley and Pete Stauber are the Republicans’ closing arguments. The DFL doesn’t have a closing argument. All they have is #Resist and #AbolishICE. Make no mistake about this. Bernie Sanders’ socialism isn’t mainstream like he claims. It’s more widely accepted amongst Democrats but it’s hardly mainstream. That’s why it’s difficult to imagine why Keith Ellison invited Bernie Sanders to campaign with him. Does Ellison still think that he’s running for election only in Minnesota’s Fifth District? In other words, Democrats will consider impeaching Supreme Court justices if they retake control of the House. It doesn’t get much ‘fringier’ than that. I’ve been writing for months that Democrats aren’t anything close to moderate. I’ve written about how Democrats unflinchingly sided with environmental activists during the Obama administration rather than side with miners or pipeline construction unions. I’ve written about Salena Zito’s observations from the campaign trail showing how disconnected Democrats are with Blue Collar America. This article highlights how immoderate Democrats are and how they aren’t pretending to be moderate anymore. Imagine being a small business owner working 60+ hours a week but then being told that they aren’t paying their fair share of taxes. To most people in that situation, they think they’re paying too much taxes while working too hard. If Democrats want to preach the gospel of tax fairness while the economy roars, that’s their option. I’ll just predict it won’t turn out well. When Alexandria Ocasio-Cortez pummeled Joe Crowley, it’s likely that Bernie Sanders did a dance. Though it’s unconfirmed, it’s likely that House Republicans quietly celebrated, too. Nobody I know faults Ocasio-Cortez for celebrating. They’re just thrilled at the opportunity to tie the open borders tag around the Democrats’ necks. Certainly, Nancy Pelosi isn’t happy with this development. She’d hoped to convince the American people that the Democrats were centrists/moderates like Conor Lamb. Thanks to Ms. Ocasio-Cortez and Mark Pocan and other Democrats pushing for the destruction of ICE, that wish disappeared. Whether Ms. Pelosi wanted to pretend she was a centrist isn’t up to her. Republicans should send special thanks to MSNBC for highlighting Ocasio-Cortez’s victory. Then again, it’s impossible to hide Joe Crowley’s defeat. Make no mistake about this. This is the Democrats’ worst nightmare. How do Democrats explain away Pocan’s bill calling for the abolition of ICE? It’s one thing to criticize the harsh treatment of children of illegal aliens. It’s another to call for open borders.